The German’s future looks close to being resolved after failing to agree a new contract at Anfield this season. 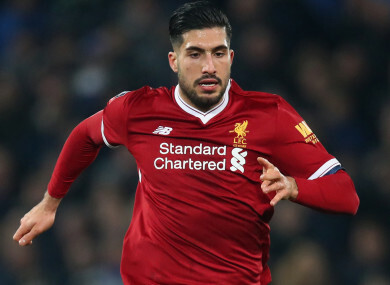 Liverpool midfielder Emre Can looks likely to join the Serie A champions this summer. JUVENTUS CHIEF EXECUTIVE Giuseppe Marotta hopes to conclude the signing of Liverpool’s Emre Can after the Champions League final. The Germany international has long been linked with the Serie A champions, having failed to agree terms on a new contract at Anfield. Reports in Italy last month claimed Can is ready to sign a five-year deal with Massimiliano Allegri’s side, despite some late interest from Bayern Munich. Marotta has now confirmed they hope to finish talks in the coming days with a view to announcing his arrival before the World Cup. “We are optimistic about a positive end to negotiations with Emre Can,” he said speaking before Saturday’s Serie A clash with Verona. The 24-year-old has been struggling with a back problem since March and is a doubt to feature against Real Madrid next Saturday, meaning he could have played his last game for Liverpool. Speaking at the time, manager Jurgen Klopp insisted the situation “is open” and that he was not resigned to losing Can on a free transfer. Can joined Liverpool from Bayer Leverkusen in 2014 and has made 24 starts in the Premier League this season. Email “Juventus hope to announce signing of Emre Can after Champions League final”. Feedback on “Juventus hope to announce signing of Emre Can after Champions League final”.